What we do know for sure is that art is certainly therapeutic, as many artists enjoy a cathartic release while working on a particular project. Many go to art galleries and museums as a way to cope with the rigors of reality, the harshness of a debt-fueled world. Art in any capacity, be it music, the stage or the canvas, can be THE thing that pulls someone out of the darkness and into the light, from the deathbed and into the ballroom. Art’s therapeutic qualities are well known amongst artists and appreciators, but hospitals nationwide are embracing it wholeheartedly, with more than half of them having Arts-in-Medicine programs or artists that are on-call. The creative arts may be able to treat patients whose pain cannot be alleviated by pills and medical procedures. One such program is The University of New Mexico Arts-in-Medicine Program (AIM), based at the University of New Mexico Hospitals (UNMH), the oldest university-based arts programs. These artists are a roving band of health-facilitators, encountering patients in every hospital room, every floor, and helping speed up the recovery process. Whether you are an actor, dancer, writer, musician, visual artist or movement specialist, Arts-in-Medicine can use you and your unique skillset. The New Mexico group has helped a variety of patients, including a painter paralyzed from the neck down. She was designated by the hospital as a problem patient who had given up hope. This is not too shocking; she lost the ability to paint, the activity that drove her soul. To help with her recovery, an artist volunteered to paint for her, to act as her hands. The paralyzed woman dictated the drawing and the painter did as directed. The process reinvigorated the patient’s hope and optimism. The next day, she was a completely different patient! Art heals; it is simple as that. 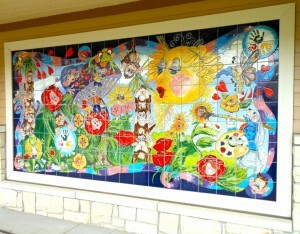 For over 28 years, I have been creating beautiful hand painted ceramic tile art in Kansas City. Given my experience doing installation pieces for children’s playground areas, public community centers and hospitals, I have seen firsthand the benefits that art has on the soul. Art is indeed THE thing that can pull someone out of the darkness and into the light, from the deathbed and into the ballroom.